Call it backpacking, Rock Climbing, or Mountaineering there is something about sleeping under the stars and fresh made cowboy coffee that not even the Ritz can compete with. Far from civilization, backpacking in the backcountry in the High Sierra is one of the most popular activities. For every overnight, and some day trips, you need to get a wilderness permit and maps from the local ranger station as most of the trails have limits or quotas on the amount of trekkers. 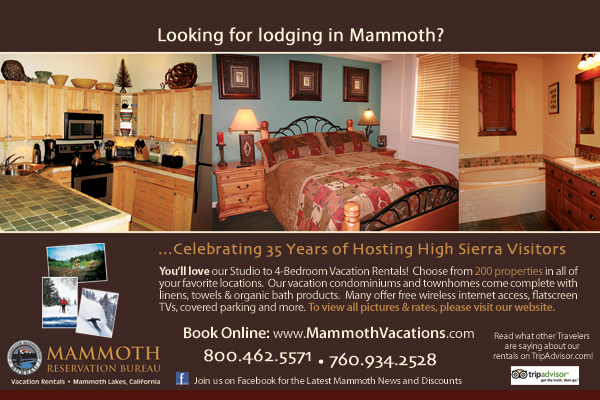 Some of the Mammoth campgrounds also require reservations and have occupancy limits. Following is a list of the popular Trail Heads and their descriptions, but by no means is the entire list. Good information is available at the Visitor Centers that are maintained by the Forest Rangers. We recommend using a certifiedMammoth guide on your expedition. They can enhance your activity and improve the level of safety on every trip. These companies can help with this adventure.